When you are trying to defend against opponents, especially plot opponents, often you find that they are attacking in bulk with one icon, rather than in weaker but spread out numbers. If you notice an opponent using mainly one icon type, likely it is time to move on to a full blocker. Full blockers are good for all pets regardless of their defense boost, making them uniquely adept for both balanced pets AND Lab Rats. This guide will provide you a quick roundup of all the most effective ways to block certain icon types regardless of your boost, while also providing you some extra tidbits needed to use them effectively. Most options given in this guide will be Multi-use, but some will be cheaper single use items which may be helpful to get users ahead during Defenders of Neopia. Before we get started breaking in to the separate elemental defense types I will start by mentioning two more broad (but limited use) blockers which are also worth keeping on hand. The best of the two is the cheap Downsize!, which offers a 50% block of all icons for one turn in any combat. Given that this is once per battle, it is great value for use in plots over hundreds of battles. For a more special combat you may consider using a Thick Smoke Bomb as it provides a single 100% block turn for one battle. Now naturally a Thyoras Tear can also be used once per battle, but lets face it - not everyone has sixty million neopoints laying around. Air is the first category of icons you may need to block. Luckily it does have a very cheap full blocker in the form of the Yooyuball Goal Net Shield which fully blocks all air, as long as earth damage is also dealt to you. While this may not be a perfect form of blocking, it is still remarkably cheaper then the alternative. 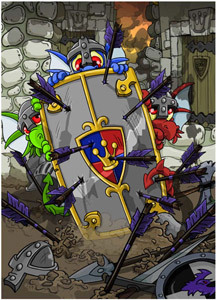 The other, more reliable option, is the Shield of Faerieland, which for twelve million neopoints from the Hidden Tower can block all air, and ten other icons. Besides this, you may try to pick up the very expensive Triple Turbo Dryer which offers 75% reflection of damage. Reflecting damage often costs a premium, and this is no different. Darkness is one of the easiest to block icon types thanks to the Hanso Charisma Charm, which provides full blocking and ten icons of extra damage. The Ghoskershield offers a more traditional sixteen icon shield with the full blocking for only eight million in the hidden tower. Reflection wise, you can always buy a 75% darkness reflector in the form of Ultimate Dark Reflectorb however the cost makes this pale in comparison to the full blocking options. Besides this, if you need a quick burst to beat an opponent once, there are two cheap single use dark blockers to boot (Starlight Potion and Stream of Light). Earth has a great deal of choice when it comes to blocking it. If you can find one for less then the other options, an Illusens Silver Shield is a good starting option. Earth also has one of the few dual blocking opportunity in the form of the Pirate Captains Hat which offers both Light and Earth. The problem with that is that it can eventually break, which is understandable due to the dual defense. Those who want a more multi-use earth blocker which can always be picked up for 6 million at most is the Shield of Pion Troect. Much like darkness there is also a single-use alternative for special fights in the form of the Potion of Concealment. Reflection wise you may also find either the 50% Earth/Light reflector Craftsmans Lens or the solid earth 75% Ultra Dual Shovel. Fire is currently the single hardest to block icon in this guide. As it stands it is also the only section in this guide in which I would be more likely to suggest the reflector to block then the actual blocker. That being said, the first item I shall mention is the 60-80% reflector Clawed Shield which, despite being technically retired, offers a cheaper alternative to the only multiuse full blocker currently around for fire (Frozen Cyodrake Shield). Besides this, if facing a heavy fire user the only real option is the single use Slippery Floor Potion which blocks both fire and water fully, but is also very expensive to use too often. 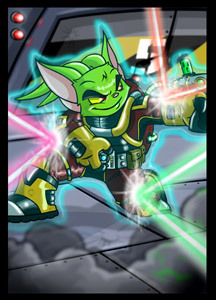 Along with earth and dark; light is also particularly easy to block. It also offers a perfect chance to point out that for a Lab Rat, any full blocker is as good as any other. 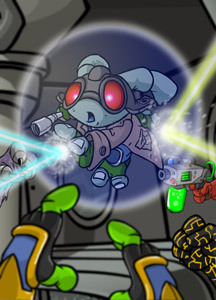 Icons are based on your defense boost, which is often low for lab rats. All those extra icons cost a lot of money and don't do much if your boost is low. The Parasol of Unfortunate Demise is the perfect example of this, as it offers a very cheap blocking solution for a very low cost. Other more expensive options with extra icons of defense include the Pirate Captains Hat, Dr. Sloths Personal Body Armour and the Hubrid Nox Memorial Shield. There is also the cursed Jhudoras Bewitched Ring which offers full blocking and a powerful attack for the cost of freedom. When you use this ring you will be unable to remove it by normal means and will instead have to transfer pets to do so. Reflection wise, you have the very cheap 50% reflecting Expert Lens, the more expensive Craftsmans Lens and the 75% Combo Battle Mirror. On top of this, it also offers two single use options for special battles in the form of Nanka Bottle and Steam Jug. So as you can see there are a lot of light options. Water is a very important icon to block given the high number of them used in the budget Dr. Sloths Personal Bath Buddy and the Kelpbeards Trident. While it is harder to block than most, you have the retired and inflated Enchanted Kiko Squeeze Toy and the currently more expensive Faerie Tabard which offers additional defense. While water was once easy and cheap to reflect, the retirement of the 80-100% reflector U-Bend of Great Justice has increased the price dramatically. Single use blocking wise, you always have the option in the Fire Jug and the Slippery Floor Potion, but keep in mind these are not solid combos for the above multiuse items for whole fights. Physical is one of the most commonly used attacking icons, which is why we are lucky the price of easily blocking it has dramatically decreased of late. While the Winged Scarab did once offer a good multiuse protection for a nice hundred thousand price tag, now it has purely been replaced by the awesomely valued Altadorian Swordbreaker, which offers really cheap physical blocking with added earth damage. On the expensive side you can always look to the Yooyuball Keepers Chest Guard, but given the cost difference there is little point. Physical is never reflected due to not being an elemental type, and there are no single use alternatives. Having and changing full blockers based on the icons your opponent uses is very smart, and can be used to help you easily combat an anagram sword in 2P battle. In a plot, changing your set depending on who you are facing can often be the difference between winning and losing. Just remember that if you are a lab rat the extra defense doesn't matter, and if you are looking for an anagram sword always check to see which is currently hardest to block. These things in mind, you should be in a much better position to fight with, and against, full blockers. Often reflection is less effective then a full blocker, so be sure to look to make sure your pet can handle the non-reflected portion of the blast. This page was last updated on February 23, 2013.